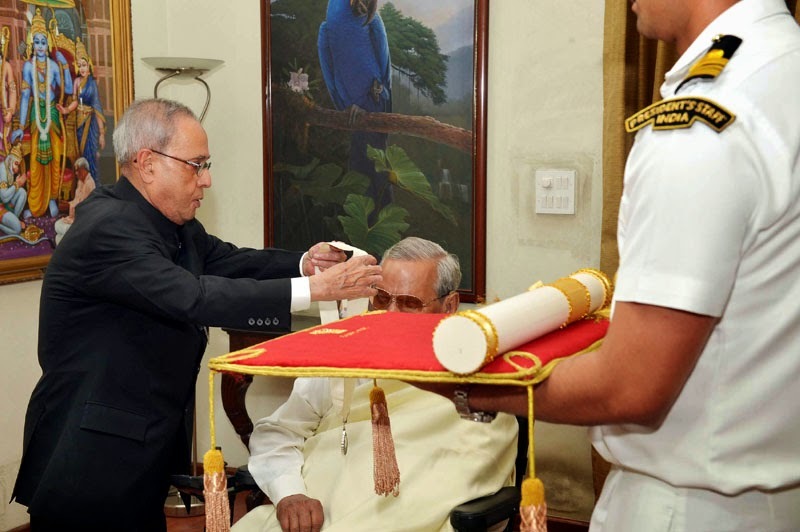 The President, Shri Pranab Mukherjee conferring the Bharat Ratna on the former Prime Minister, Shri Atal Bihari Vajpayee, at his residence, in New Delhi on March 27, 2015. The President of India, Shri Pranab Mukherjee conferred the Bharat Ratna onShri Atal Bihari Vajpayee this evening (March 27, 2015) in New Delhi. In a special gesture, the President conferred the Award in a simple ceremony held at the residence of Shri Vajpayee. Shri Mohd. Hamid Ansari, Vice President of India; Prime Minister Shri Narendra Modi; former President Dr. APJ Abdul Kalam; former Prime Minister Dr. Manmohan Singh; Union Home Minister Shri Rajnath Singh; senior members of the Cabinet; several Chief Ministers; leaders of political parties; members of Shri Vajpayee’s family and other dignitaries were present on the occasion. “On the joyous occasion of Ram Navami, I extend greetings and good wishes to all fellow citizens. The Vice President of India Shri M. Hamid Ansari has greeted the citizens of our country on the occasion of Ram Navmi, which marks the birthday of Lord Rama. In his message, he has said that may the life and message of Lord Rama inspire us to uphold the highest moral, ethical and humane values. The Prime Minister, Shri Narendra Modi, has expressed grief at the passing away of Brigadier T Sailo. "Brigadier T Sailo`s demise is deeply saddening. 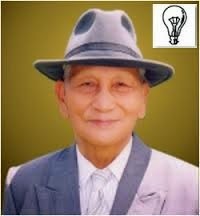 He will be remembered as a multifaceted personality who worked for Mizoram`s progress," the Prime Minister said. Prime Minister, Shri Narendra Modi has expressed grief at the passing away of former Union Minister Shri PR Kyndiah and has extended his condolences to the bereaved family. The Prime Minister described Shri PR Kyndiah as a popular leader who worked tirelessly for Meghalaya and the Northeast. Mr Yukiya Amano, Director General of the International Atomic Energy Agency called on the Prime Minister, Shri Narendra Modi, today. The Prime Minister lauded IAEA for its enormous contribution to the promotion of safe and secure use of atomic science for peace and development in the world – goals that India shared. He thanked Director General Amano for his leadership in focusing IAEA`s efforts on human development, including food security and health; for enhancing safety standards in nuclear power plants and other facilities; and, for IAEA`s continuing high standards in its regulatory role. The Prime Minister attached special importance to IAEA`s crucial role in generating public awareness and confidence on safety aspects; and, in supporting efforts to make nuclear power more affordable. The Prime Minister recalled India`s excellent relations with IAEA since India became a founding member of the agency. As a member of the Board of Governor of IAEA, India, he emphasised, attached utmost importance to advancing the goals of IAEA. The Prime Minister conveyed that he considered nuclear energy to be vital for supporting economic development in India, meeting the energy needs of our people and addressing the challenge of climate change. At the same time, he sought to place special emphasis on using atomic science for addressing the needs of ordinary citizens, by application in areas like health care, agriculture, food preservation, clean water and waste management. He reiterated India`s commitment to maintaining the highest global standards of nuclear safety and security. Director General Amano expressed appreciation and admiration for the India`s progress in nuclear science and technology, focus on developmental aspects, commitment to the highest levels of safety and security standards, and record as a responsible nuclear power; the excellent relations between IAEA and India; India`s contribution to the work of IAEA; and, India`s assistance to neighbouring and other countries in the peaceful and developmental aspects of nuclear science. A five-member team, which is embarking on the first All India Services Expedition to Mt. Everest, called on the Prime Minister, Shri Narendra Modi, today. The team consists of five civil servants, including 2 IPS, 2 IAS and one IFS officers. It is led by Mr. Ravindra Kumar, an IAS officer of 2011 batch. The other officers include Ms. Saroj Kumari, IPS-2011; Mr. S. Prabhakaran, IFS-2011; Mr. Vikram Jindal, IAS-2012; and Mr. Suhail Sharma, IPS-2012. The expedition will be carrying the banner of Swachh Bharat to the peak. 2015 marks the golden jubilee of the first-ever Indian expedition to Mt Everest in 1965. The Prime Minister conveyed his best wishes for the success of the expedition. The Prime Minister, Shri Narendra Modi, today appealed to well-to-do sections of Indian society to voluntarily give up LPG subsidy, so that the benefit of the same could be shared more widely with poorer sections of society. Delivering the inaugural address at the global energy summit – Urja Sangam-2015 – in New Delhi, the Prime Minister said about 2.8 lakh people from across the country had already given up LPG subsidy. He said this was an important contribution for the service of the poor. The Prime Minister called for enhancing domestic production to reduce the energy import burden of the country by at least 10 percent, till 2022 – the occasion of the platinum jubilee of India`s independence. The Prime Minister complimented ONGC Videsh Ltd, Engineers India Ltd, and Barauni Refinery, for their successful journey of five decades, and called upon India`s energy sector to plan for the next five decades with a global perspective. He said India, with one-sixth of the world`s population, should shoulder one-sixth of the world`s energy responsibility, hence contributing to global prosperity. The Prime Minister highlighted various achievements of the Union Government, and reforms initiated in the energy sector over the last ten months. He said these reforms were motivated by the quest for greater energy security, which is both a necessity and responsibility. He said transfer of LPG subsidy directly into bank accounts through the world`s largest cash subsidy transfer programme in the world – PAHAL – had resulted in elimination of leakages, and curbing corruption. He also mentioned deregulation of diesel prices, ethanol blended petrol to help sugarcane farmers, promotion of bio-diesel, and extension of the gas grid in eastern India, as some of the other major initiatives of the Government. The Prime Minister said the Union Government aims to extend piped natural gas (PNG) to one crore houses over the next five years. The Prime Minister called upon Indian energy companies to become multinational; work towards India-Middle East, India-Central Asia, and India-South Asia energy corridors; and establish gas positions in North America and Africa. Union Ministers Shri Ravi Shankar Prasad, Shri Dharmendra Pradhan, Smt. Nirmala Sitharaman, and Shri Nasrul Hamid – State Minister for Power, Energy and Mineral Resources of Bangladesh, were present on the occasion. The Gandhi Peace Prize for the year 2014, has been awarded to Indian Space Research Organisation (ISRO). The Jury for the Prize met under the Chairmanship of the Prime Minister, Shri. Narendra Modi this evening. The other members of the Jury were Justice H.L Dattu, Chief Justice of India, Shri Mallikarjun Kharge, Leader of the single largest Opposition Party in the Lok Sabha, Shri. L.K. Advani, Member of Parliament (L.S) and Shri Gopalkrishna Gandhi. Indian Space Research Organisation (ISRO), an organisation of Government of India, is engaged in making space technology a catalyst of development to bring about societal transformation. The Indian Space Research Organisation (ISRO)’s mission is to provide the nation with space based services and to develop the technologies to achieve the same. Through the years, ISRO has upheld its mission of bringing space to the service of the common man and in the service of the nation. In the process it has become one of the six largest space agencies of the world. ISRO contributes to the nation’s development through satellite based education, health care and connectivity to community activities for sustainable economic development. Besides this, ISRO through space technology has allowed for improved mapping of agricultural land and water-shed areas, providing advisories to fishing communities, giving information support for decentralised planning, creating data base of heritage sites, better climate and disaster management support and promoting a knowledge based society, which has led to social, economic and political transformation through non-violence. ISRO also has through tele-medicine, one of the communication technology applications, has enhanced the healthcare services delivery, wherein a satellite tele-medicine network through INSAT system links the rural hospitals in the country with specialty hospitals to enable the rural populace to access the specialist medical consultations. Similarly, Tele-Education has demonstrated the unique capability of satellites in virtually taking the best teachers in the country to teach students in the rural villages. The Gandhi Peace Prize for social, economic and political transformation through non-violence was instituted in the year 1995. The Award comprises an amount of Rupees One crore and a citation. Some of the previous awardees have been Dr. Nelson Mandela, Mr. Vaclav Havel, Dr. Julius K. Nyerere, Baba Amte, Archbishop Desmond Tutu, Grameen Bank of Bangladesh, Bharatiya Vidya Bhawan and Ramkrishna Mission. The Union Minister of State (Independent Charge) of the Ministry of Development of Northeastern Region (DoNER), MoS PMO, Personnel, Public Grievances, Pensions, Atomic Energy and Space, Dr. Jitendra Singh has announced the concept of ‘DoNER at doorstep’ during an interactive programme called “Meet the DoNER Minister” organized by a social organization “My Home India”, here yesterday. Dr Jitendra Singh has discussed the objectives of the DoNER Ministry and a host of new initiatives undertaken during the past four months ever since he had assumed the charge of this Ministry. Dwelling on some of the recent initiatives undertaken, he said, he is proud at the success of the concept of rotational Camp Secretariat introduced in January this year which is unique of its kind and is meant to convince the people of Northeast that for redressal of their grievances, they need not each time travel to New Delhi, but New Delhi can also reach their destination. He has therefore, coined and introduced the expression “DoNER at doorstep” for this concept and such Camp Secretariats have already been held in Manipur and Arunachal Pradesh and third Camp Secretariat is scheduled to be held in Mizoram from March 29 onwards, he added. Under the guidance of Prime Minister, Shri Narendra Modi, Dr. Jitendra Singh said, the DoNER Ministry has formulated a roster wherein during each given fortnight, at least eight Union Ministers from New Delhi will be visiting Northeast which means that one Minister each will be available in each of the eight States every 15 days. This will help them to make an assessment of the development works related to their Ministries and also enable them to gain first-hand inputs from the local population there, he added. Dr. Jitendra Singh said that Northeast is a cherished priority and a part of Prime Minister, Shri Narendra Modi’s vision which reflected in the announcement by him of a Sports University in Manipur during his recent visit there. Taking cue from this, Dr. Jitendra Singh said, DoNER Ministry has already started the process of locating land for bringing up exclusive hostels for students from Northeast and two such locations have already been earmarked in the premises of Jawarlal Nehru University Campus New Delhi and South Campus of Delhi University. Stressing upon the Northeast youth in the gathering that it is their responsibility to highlight the huge contribution made by them to the academic and social life of the Union Capital of Delhi, Dr. Jitendra Singh lamented that while sometimes Northeast is in news for unflattering reasons, the lesser known fact is that Northeast students are also contributing immensely to the academia of Delhi. Citing figures, he said very few are aware that in some of the Universities, like for example Jawaharlal Nehru University, there are more than 6% students from Northast which when calculated, amounts to at least 60 students from each of the eight Northeast States, which is a figure higher than the number of students from certain States like Himachal Pradesh and Jammu & Kashmir. Shri T R Zeliang, the Chief Minister of Nagaland, called on the Union Agriculture Minister, Shri Radha Mohan Singh in New Delhi today. It was a courtesy call. Various points discussed included establishment of a Veterinary College in Nagaland, employment opportunities and Infrastructure development. Union Agriculture Minister, Shri Radha Mohan Singh emphasised on the importance of Soil Health Management, Irrigation and Organic farming. Shri Singh informed Ministry of Agriculture officials to form a committee and consult State Government for doing a feasibility study on the setting up of the college. Shri T R Zeliang invited Shri Radha Mohan Singh to visit Nagaland as per his convenience. As per the latest reports received from States, the area under rabi rice as on today stands at 39.43 lakh hectare as compared to 43.55 lakh hectare at this time last year. Total area under rabi rice and summer crops moves to 52.20 lakh hectare as compared to 55.28 lakh hectare at this time last year. It is reported that 0.53 lakh hectare area has been covered under summer pulses in Bihar followed by Gujraat (0.30 lakh ha), Utter Pradesh (0.20 lakh ha), West Bengal (0.17lakh ha), Karnataka (0.15 lakh ha), and Madhya Pradesh (0.05 lakh ha). Sowing of summer oilseeds has been reported from the state of Karnataka (2.19 lakh ha), West Bengal (1.85 lakh ha), Odisha (1.26 lakh ha), (Gujarat (0.98 lakh ha), Tamil Nadu (0.68 lakh ha), Maharashtra (0.38 lakh ha),Andhra Pradesh (0.34 lakh ha), Chhatisgarh (0.25 lakh ha), and Telangana (0.21 lakh ha). The Department of Agriculture & Cooperation has approved the Price Stabilisation Fund (PSF) as a Central Sector Scheme, with a corpus of Rs.500 crores, to support market interventions for price control of perishable agri-horticultural commodities. PSF will be used to advance interest free loan to State Governments and Central agencies to support their working capital and other expenses on procurement and distribution interventions for such commodities. For this purpose, the States will set up a revolving fund to which Centre and State will contribute equally (50:50). The ratio of Centre-State contribution to the State level corpus in respect of North East States will however be 75:25. The revolving fund is being mooted so that requirements for all future interventions can be decided and met with at the State level itself. Central Agencies will, however, set up their revolving fund entirely with the advance from the Centre. Procurement of these commodities will be undertaken directly from farmers or farmers’ organizations at farm gate/mandi and made available at a more reasonable price to the consumers. Initially the fund is proposed to be used for onion and potato only. Losses incurred, if any, in the operations will be shared between the Centre and the States. Detailed guidelines for the scheme have now been approved and are available on the departmental website www.agricoop.nic.in . Union Agriculture Minister Shri Radha Mohan Singh along with Minister of State visited areas of Maharashtra, Uttar Pradesh and Rajasthan which have been affected by untimely rains. They assure a farming community that the government stands with them in this hour of crisis. They further assured the farmers that the Central Government is committed to provide irrigation water to every farmer and every field. Agriculture Ministry has also contributed all the State Governments to release appropriate relief compensation from their State Disaster Response Fund (SDRF) without any delay. In case there is any short fall of money in these funds the State Governments may fall upon their contingency funds as well as demand for more money from the National Disaster Response Fund (NDRF). In this regard, Government of India has asked the State Governments to submit their memorandums. The Government has also directed the states to take necessary steps for restructuring farmer loans and disbursement of crop insurance. Agriculture Ministry, Government of India has sent seven senior officers to the affected states of Madhya Pradesh, Gujarat, Maharashtra, Punjab, Haryana, Uttar Pradesh and Rajasthan to do an initial assessment of crop damage. This is a historic initiative as never before the Union Government has sent teams before receiving reports from State Governments. The Prime Minister has taken a video conference with the states and their concerned Chief Secretaries’ yesterday i.e. 23.03.2015 and the estimated crop loss which was earlier quoted to be 181 lakh hectare of the State Governments has now been reduced to 106 lakh hectare. Government of India has directed the State Governments to quickly do a final assessment.